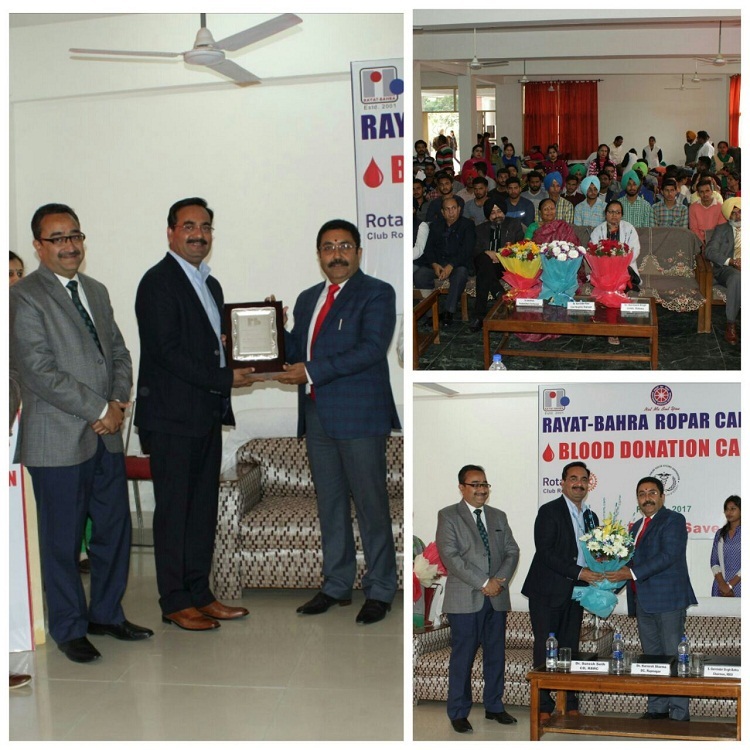 Rayat-Bahra Ropar Campus in collaboration with Punjab Health Systems Corporation, SGHS Charitable Hospital Sohana, Rotary Club Ropar, NSS Unit of RIEIT and RIM organized a Voluntary *Blood Donation Camp* in connection with celebrating the International Science Day on 28th Feb., 2017. Sh. Karnesh Sharma, Deputy Commissioner, Distt. Rupnagar, was the Chief Guest on this occasion. Speaking on the occasion, S. Gurvinder Singh Bahra, Chairman, Rayat-Bahra Group blessed and thanked the blood donors for participating in this noble cause by joining hands with NSS Volunteers to serve the society at large. Dr. Suresh Seth, Campus Director in his address said that students are always encouraged to devote themselves towards the principle of community service and generosity at Rayat-Bahra. Organizing a blood donation camp is just another step in this direction. Dr. Ajay Goyal, Director RIEIT stated that 413 units of Blood have been collected in this Camp. Donors were given refreshments and certificate of appreciation for their service to humanity.